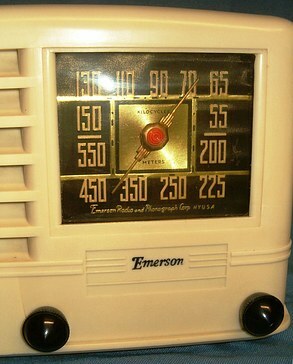 A 1939 Emerson model 330 tube radio. 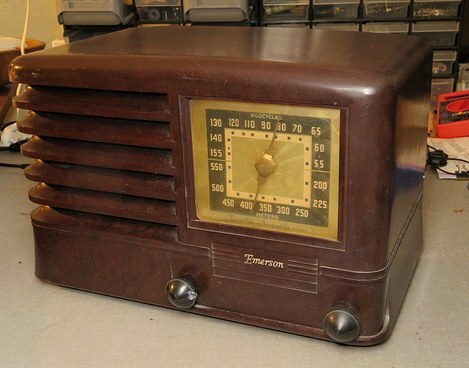 Sold to someone in 1939, this radio may have announced the news of Germany invading Poland, and that the Japanese had bombed Pearl Harbor. 40 years later, no longer working and covered in white paint, it was thrown in the trash. It was taken out of the trashcan by somebody walking down the street that day. 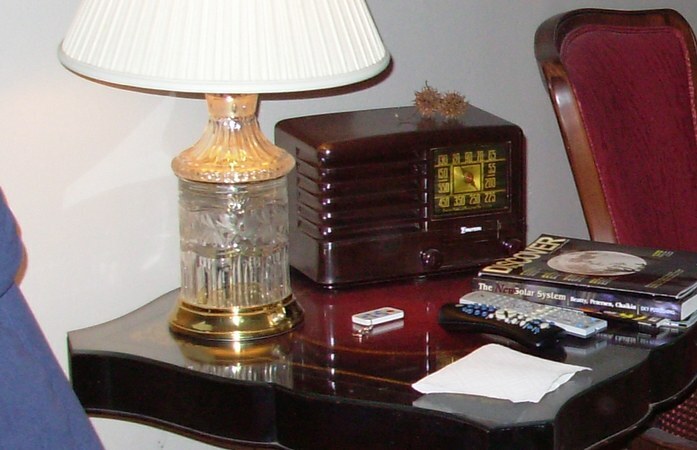 The radio is called the "Apartment radio" because it was in my apartment from 2004 to 2008. The weird things on top of it are "sticky balls" from a tree - souvenirs from a sticky ball fight I was in with my 6 year old grandson. I still have them. 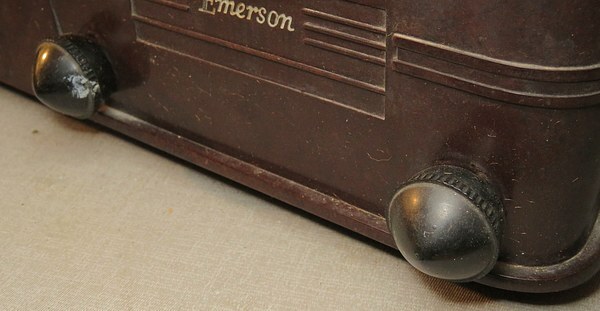 I don't remember where the radio came from, but I've had it since the early 1980s. It was trash picked, but I don't know if I trash picked it or if somebody else did and gave it to me. It was covered with white brushed on oil paint and I was never able to get all the paint off. 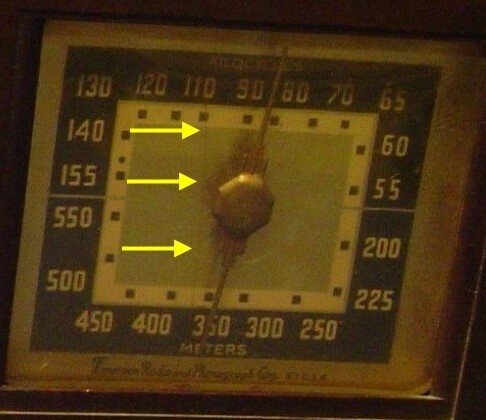 When the radio was in the apartment it stopped working one day and I never looked into it. 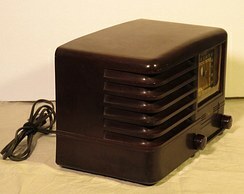 I had a large Grundig Satellit 800 that I actually listened to. 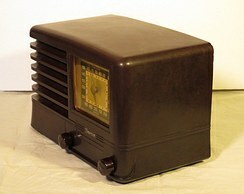 The "Apartment radio" was just a decoration after it stopped working. Now it's time to fix it. 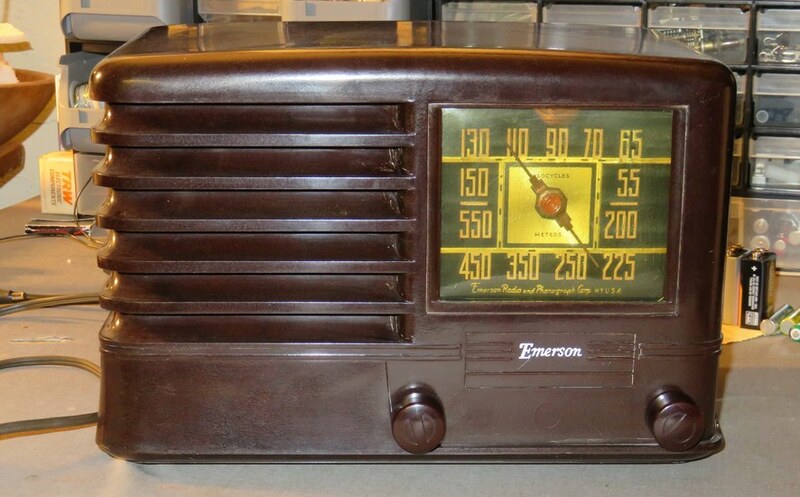 To identify the radio I did a Google search of "Emerson tube radio" and found the above on ebay. 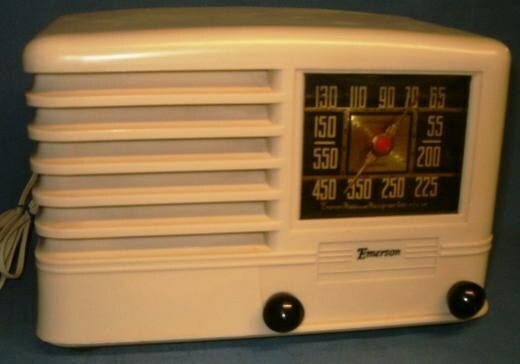 I learned it was a model 330, the knobs on my radio were the wrong type, and it once had a gold cloth covered electric cord. I needed those knobs! 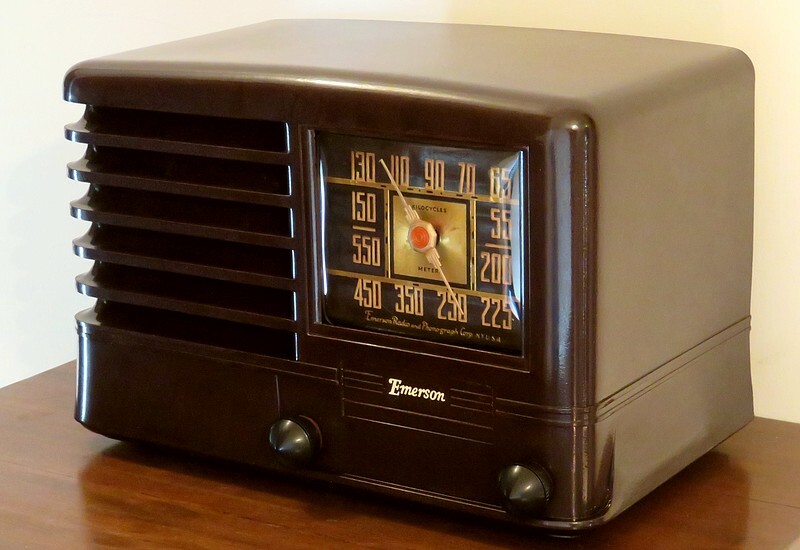 Many of the 1930s Emerson radios had them, even if they didn't "go" with the cabinet design. Maybe it was just my luck, but there were only two pairs to be found on the Internet. 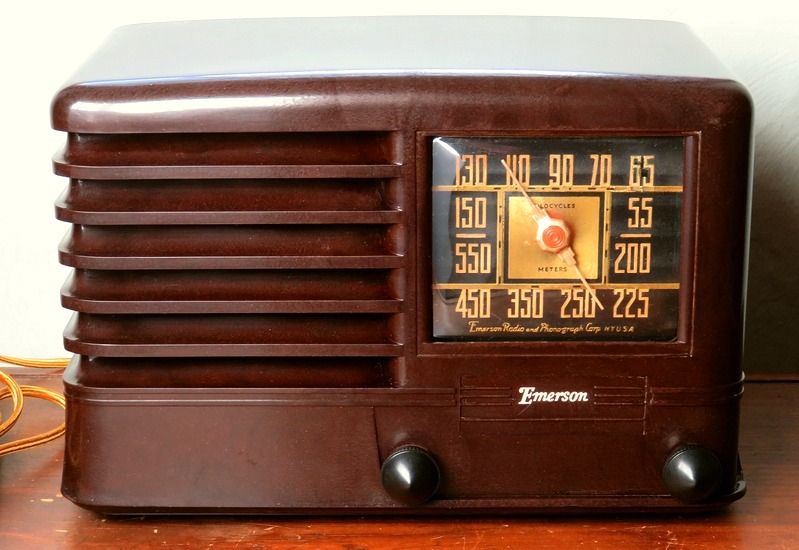 An ebay seller wanted $25 for a pair, and a private seller on a radio site wanted $15. 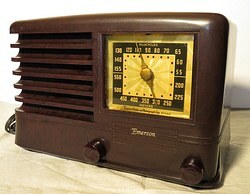 The radio above was $20 with no bids, so I bid $20 and won the radio. 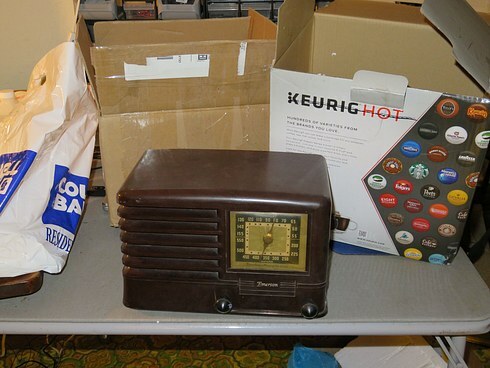 The $20 went to the "Vintage Radio and Communications Museum of Connecticut." The above pictures narrowed down the year to 1939 based on the dial face. They also verified I had the correct "airplane" dial pointer. This is a nice one. Now what about the plug? The plug on the gold cord looks like it came from a hardware store. 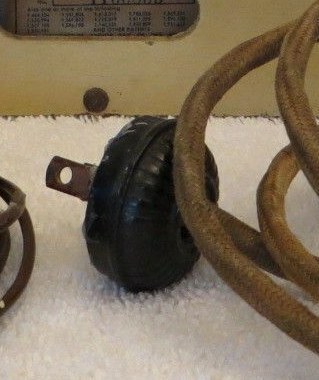 The center picture shows the plug on the "Apartment radio," which has a design of oak leaves and acorns molded into it. I think what the actual plug looked like is on the right. 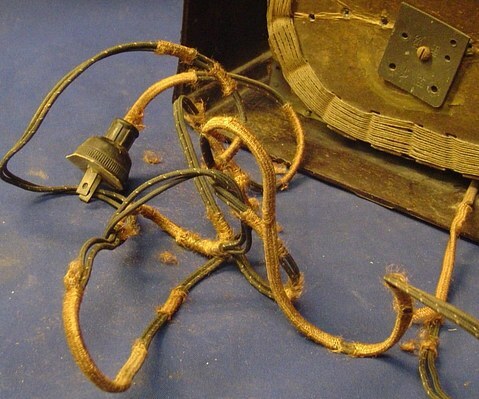 This is the plug from an "all original" 1939 Emerson "Snow White and the Seven Dwarfs" radio that sold for $1,250.00. 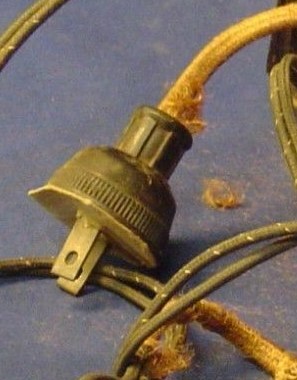 Apparently, the plug in the center photo is not original but is close to it, so it will stay. This is what I found wrong with the outside and we haven't seen the inside yet. I plugged it in and turned it on, and of course it worked perfectly, even though it had stopped working 10 years ago. 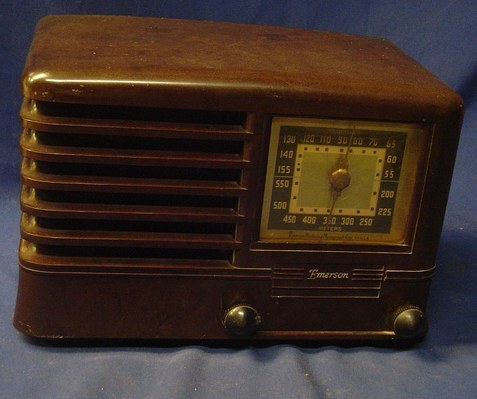 Before I started "repairing" it I ordered a new dial cover, reproduction back (it doesn't have a back), a gold cloth covered cord, and the radio from ebay to get the knobs. November 14, 2016 I find this on the back porch. The guy sent it two day delivery! 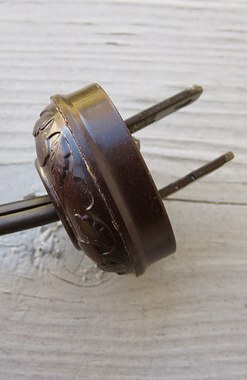 Nice knobs! Look at all the packing, we don't have room for that. I'm going to switch the knobs and put it back up on ebay in the same box it came in. It looks good in the pictures, but it was actually very dirty and the dial cover had a crack in it. When I plugged it in, it worked! I went back on ebay to see if the crack was mentioned. It was not. It said, "See photos for details". This is a crop of a larger photo from the auction. I put the arrows there. 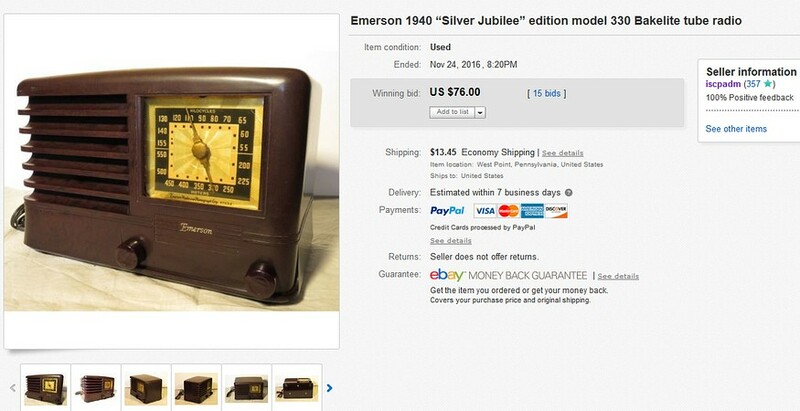 It's a 1940 "Silver Jubilee." What does that mean? In this case, "Silver" means 25 and "Jubilee" means anniversary. 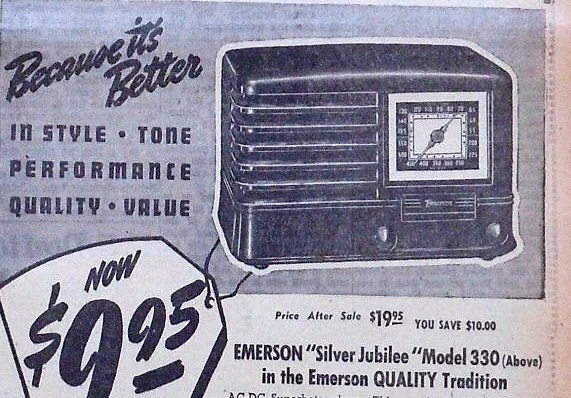 Emerson Radio was incorporated in 1915, so this was their 25th anniversary. We don't say things like "Silver Jubilee" anymore. If I told my kids I had a Silver Jubilee they'd think I'd bought a new car. The two cases. The Silver Jubilee on the left has been cleaned. 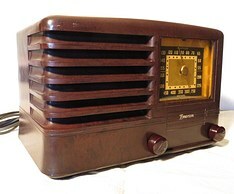 The Apartment radio on the right was cleaned and polished. 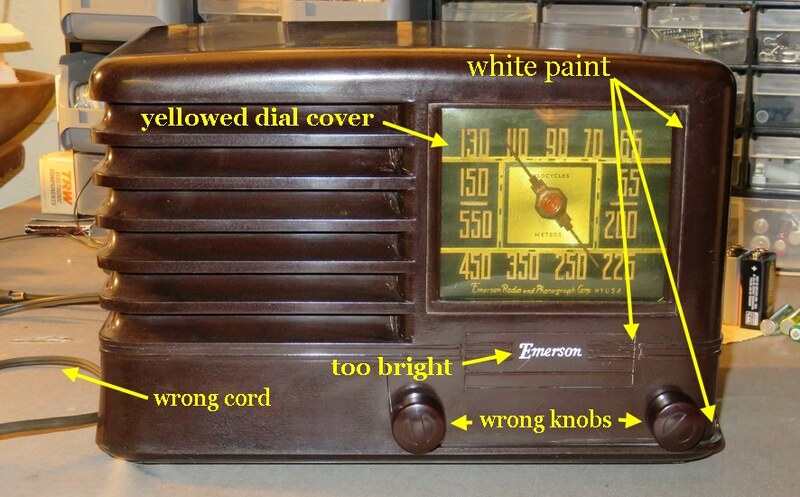 The Apartment radio case was worked on for several hours, trying to get the last of the white paint off it. I contemplated swapping the cases, but the whole point of continuing this project was to bring back to life something that had been painted and then thrown in the trash. After cleaning the case and swapping the knobs, cracked dial cover, frayed electrical cord and plug, the Silver Jubilee was packed back up and put back on ebay on November 17, 2016. I asked $21.50. Even though I had stolen the knobs, a new dial cover is $20. If the new owner buys those $15 knobs he'll still be $3.50 ahead of the game, he just won't know it. I did spend over an hour cleaning it, too. Well I just don't know what to say. After the postage and ebay and PayPal fees, I needed $43.99 to break even, but didn't expect to get it. I refunded the buyer $30.00 and sent him a link to those $15.00 knobs!